The HugMee: warmth and uninterrupted skin-to-skin contact immediately after a gentle sectio. The HugMee is a support sling which is used immediately after the gentle sectio in the operating theatre. 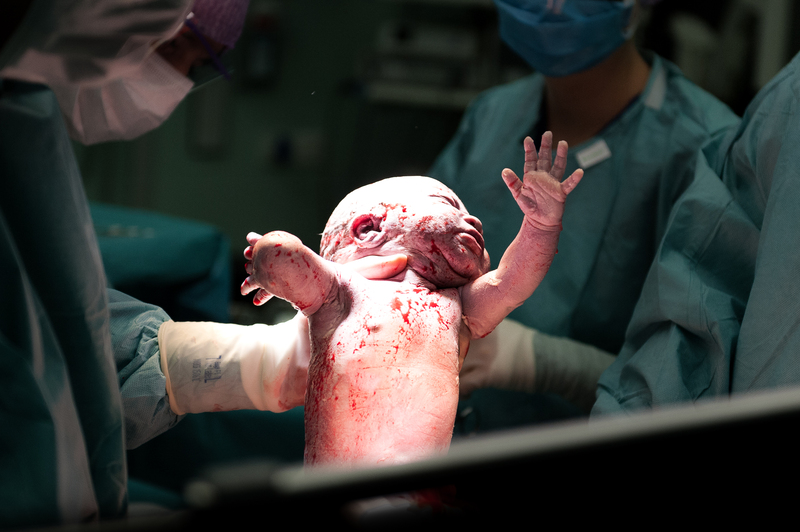 The HugMee was especially developed for the natural caesarian (gentle sectio), also called the family-centred caesarian. The HugMee allows mother and child to stay together safely and undisturbed skin-to-skin immediately after the birth. In the first period after the birth the HugMee can also be used at home. Skin-to-skin contact immediately after the birth is essential for the child’s bonding. Certainly the first hour after the birth. This hour is also called ‘The Golden Hour’ or ‘the Secret Hour’. It is the time when the basis is laid for a healthy socio-emotional, cognitive and motor development of the baby. In this light it is crucial that mother and child get the time and the rest to get to know one another. Scientific studies conclusively show that uninterrupted skin-to-skin contact has advantages for both the mother and the child. exclusive and longer duration of the breastfeeding period. stabilization of heartbeat, respiration and blood pressure. blood sugars stay at a better level. positive effects on the building up of the immune system. the milk production will be stimulated faster. it is fully adjustable, and therefore the baby can be positioned very well. the baby lies safe and warm with the mother. immediately after birth undisturbed skin-to-skin contact is possible. it offers a safe transfer of the mother with the baby from the OR table to the hospital bed. there is a cut-away on the back for the epidural. There are two openings for the hands to touch the baby. A foot pocket ensures safety and security. It is washable at high temperatures. This baby is born via a gentle sectio. Watch here how the HugMee is applied in the hospital! Before the caesarian the HugMee is put on at the department. The HugMee is fully adjustable on both sides. The gown is put on over the HugMee. 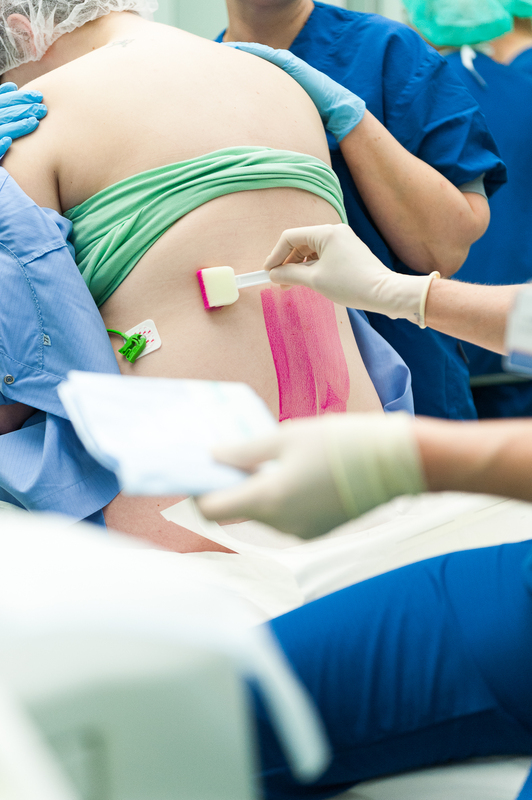 The HugMee has a cut-away at the back in connection with the epidural. The baby is born. Afterwards it is dried off and gets a hat on its head. The baby is positioned on its side skin-to-skin in the HugMee. During the transfer from OR table to bed the baby can stay safely with the mother. Both mother and father can touch the baby through the openings in the HugMee. 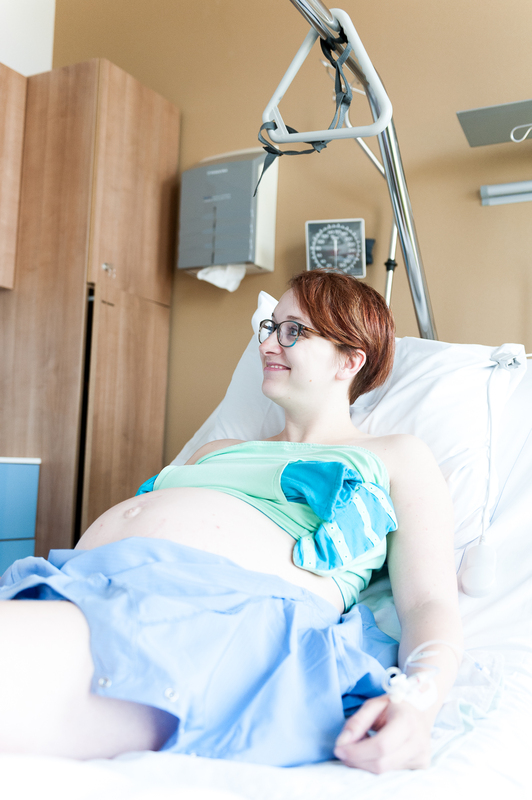 Also after the caesarian the HugMee is suitable for safe and comfortable skin-to-skin contact.